RENOVATED CORNER UNIT WITH STUNNING GULF AND INTRA COASTAL WATERWAY VIEWS! This immaculate condominium is an exceptional island retreat and is being sold fully furnished! UNDER BUILDING GARAGE SPACE INCLUDED IN THE SALE (A $40,000+ VALUE). ALL NEW DOUBLE PANE WINDOWS AND SLIDERS, ELECTRIC STORM SHUTTERS ON WRAPAROUND BALCONY for added protection! Renovated kitchen with quiet close drawers, granite counter tops and breakfast space overlooking the Gulf of Mexico to the west! 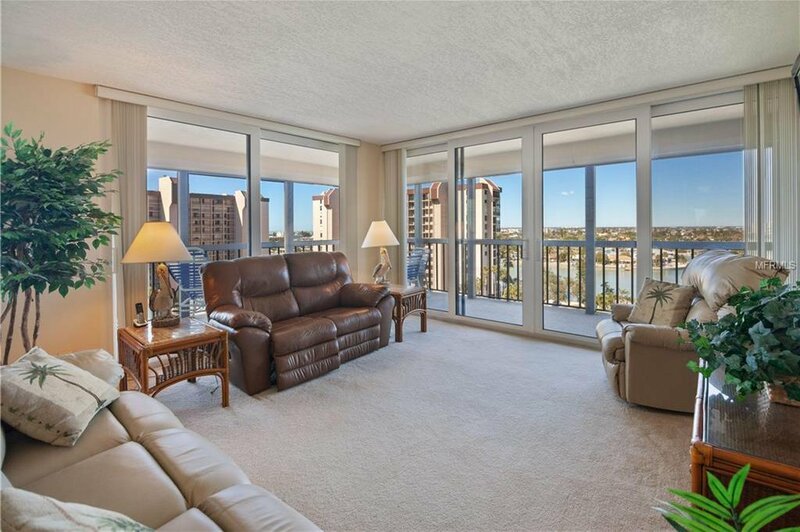 Spacious living area with access to the wrap around balcony to take in the waterfront views of the Intra Coastal Waterway. 2 SPACIOUS BEDROOMS WITH WALK IN CLOSETS. Both bathrooms have been fully renovated; new vanities, new fixtures, smooth surface showers; master bath features granite counters and etched glass mirror by Coastal Glass. Guest bath with cultured marble counters and stack front load washer/dryer. No popcorn ceilings here! Textured ceilings, updated HVAC, water heater, and appliances. Meticulously maintained Yacht & Tennis Club is a 1st class gated community with wonderful amenities: marina with boat slips available for sale or lease. Tennis anyone? 7 QUALITY Har Tru tennis Courts, 24 hour security and guard gate entry, renovated fitness center with group fitness classes in high season, renovated waterfront heated pool, whirlpool, barbecue deck and gazebo dining area, plus men's & women's saunas. Renovated clubhouse,billiards, grills & decks. Near beach, restaurants & shops. DRONE & WALKING TOUR VIDEO ATTACHED!